When the Department of Energy called for bids to supply renewable energy to the South African grid, they produced a bid document which described the conditions and information required from bidders. 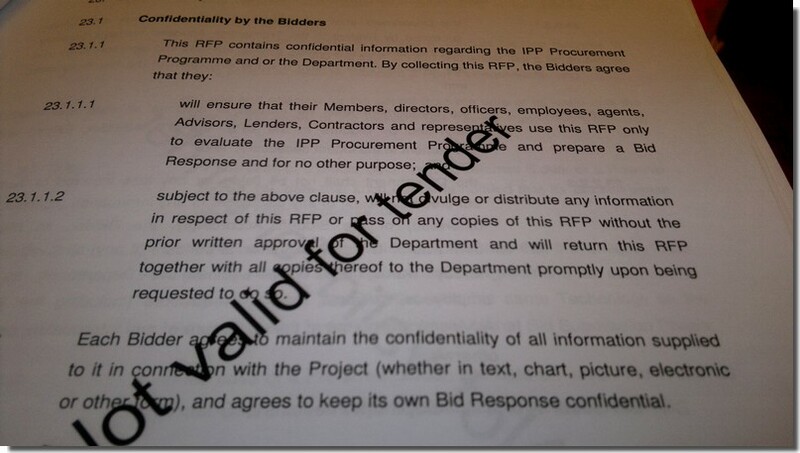 This was only available to prospective bidders who paid a fee of R15 000, and signed a confidentiality agreement which included the stipulation to “not divulge or distribute any information in respect of this RFP or pass on any copies of this RFP”. The nuclear power industry is deeply troubled, with little cause for optimism. There is growing worldwide public resistance to nuclear power stations, President Obama has terminated government subsidies in the USA for nuclear power, and Germany and Switzerland have committed to shutting down all their reactors. While the renewable energy industry has seen dramatic growth and constantly falling costs, the nuclear industry grapples with spiralling costs, the seemingly intractable waste disposal issue, and the ongoing huge economic and human costs of the Fukushima nuclear disaster.